I visited the stunning new St John's Catholic Comprehensive School in Kent. It opens in a year. Like the best of the 21stC schools - and this is certainly one of the very best - they have listened, thought, designed and built and not been deflected by value engineering and other nonsense. It's on budget too. The school is almost entirely corridor free. And with the colossal saving this brings they have created a HUGE build which is subdivided into three Communities - very much a cross between the proven schools within schools and Home Base models. There is joyfully specified specialist space - gym, dance studio, media centre (ceiling height raised to allow trampolining outside of the gym!) etc but science, maths and more are all taught within the Communities, which are all age, with vertical pastoral structures. The building is open, multifaceted, and has acres of glass but very few internal walls. As the levels drop rows of steps provide little natural amphitheatres and seating for each community. It looks very much like our Caribbean schools in the Cayman Isles - even to the "Nair-esque" Da Vinci studios that mix subjects - science with other explorations. natural llight is everywhere. All this begs a question: why on earth are schools being allowed to be built with a third of their budget wasted on corridors? How can this waste of money be tolerated? How can architects be allowed anywhere near these designs if they just do cells and bells? Part of the answer is that the wretched Building Bulletins can be seen as encouraging this specialist circulation space. Time for a re-write and clarification surely...? One improvement for St John's? Like many others, they will find they probably haven't got enough mains sockets... The front face of the steps would have been a good place to put them maybe. Meanwhile St John's has one more year to explore new pedagogies, new structures and new ambitions... having spoken to the staff and exceptional Head I'd simply say "safe in their hands". Stephen. This is encouraging indeed. I teach at a small university in northern Japan and the structure is unlike other traditional universities and schools here. 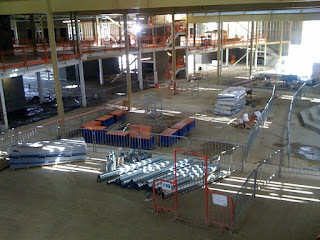 See link for some snapshots: mainly glass, lots of open space, few corridors. (http://gallery.mac.com/mvallance#100034&bgcolor=black&view=mosaic&sel=0) University images This is not the norm in japan though as most schooling is still chained to a rigid test-based curriculum. Therefore, although the building may be 'open' the challenge is to 'open' minds to new pedagogies. This is the greater challenge but having a physical structure like this sets us on our way.